It’s always tricky when you plant seeds for the first time and you don’t really know what the plants look like as seedlings. It can be hard to distinguish a weed from a new plant so I often find myself pulling up things that I later regret in a frenzy to stay on top of the weeds. The mystery bunch. Some I’ve since identified as butterfly milkweed (left), some sunflowers (right) and easily recognized basil (top right). I planted some butterfly milkweed I picked up at Urban Harvest and some scabiosa seeds from one of my plot neighbours. She had some really dark ones that I found very striking. 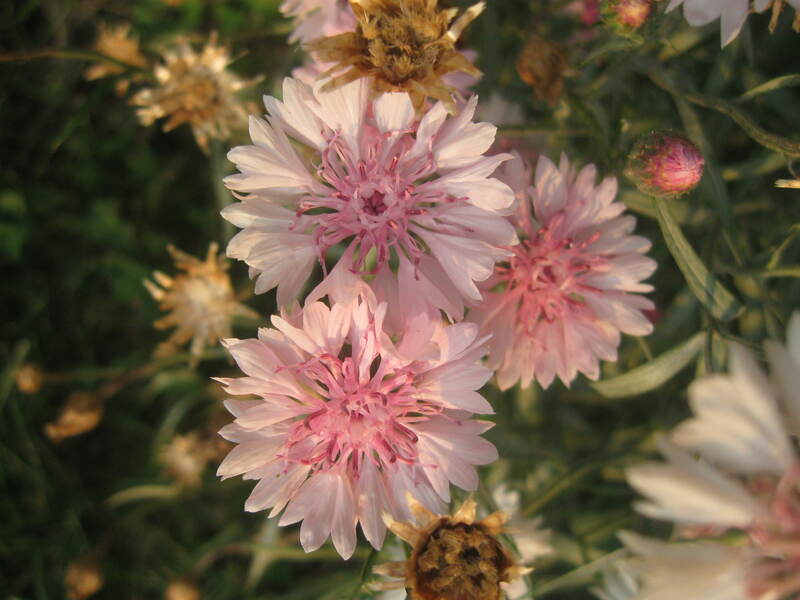 She tells me these are the scabiosa I planted. 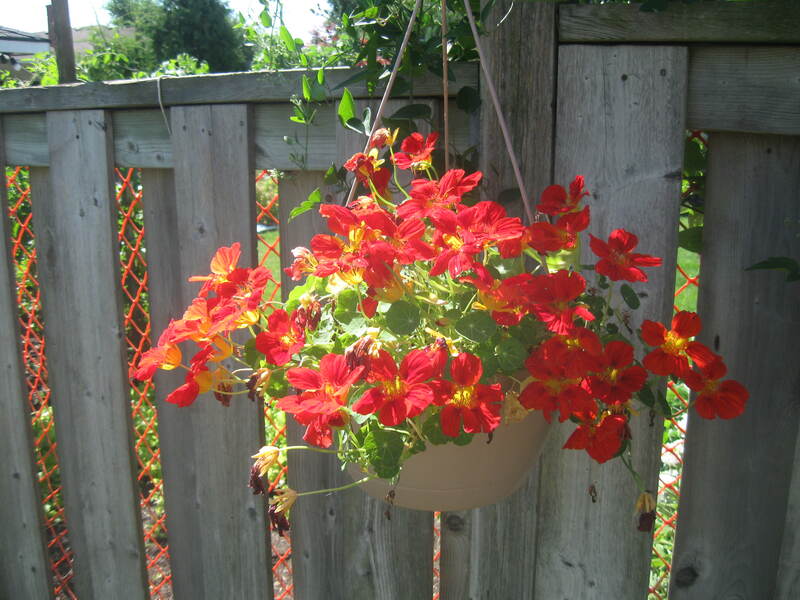 Rather than growing veggies, she grows flowers specifically for cuttings. 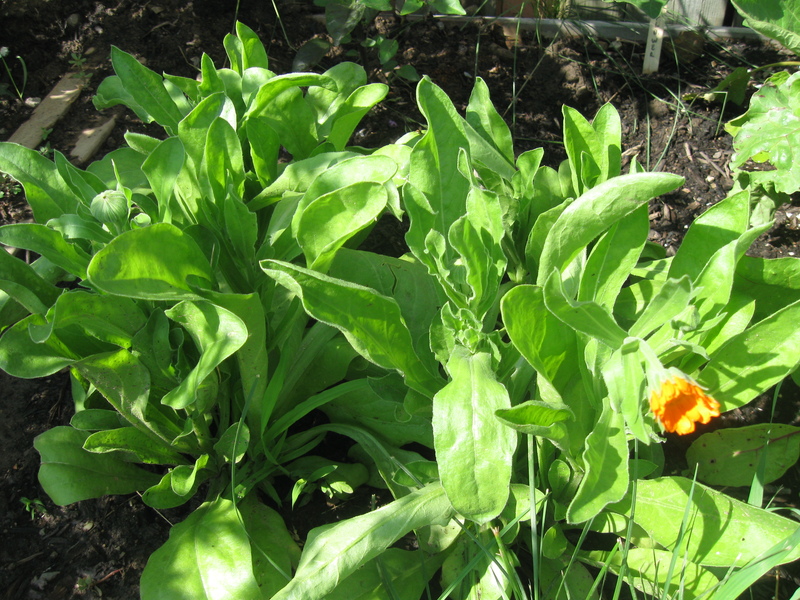 She tells me some flowers don’t really do well as cuttings, like the calendula and cornflower I always plant. I’ve taken my sunflowers home and even bought them from the farmers market. Although they do hold up for a while, I find they get sticky with sap and harbour bugs. Calendula doesn’t last long as a cut flower. It also oozes a sticky sap that makes it messy but sought after for salves or other personal care items. You can see the sap oozing from the head, and a tiny insect on the leaves. The pollen coming out of the back flower is interesting to behold, but with no bees to harvest it, it ends up making a mess when it falls. Beautiful to look at though. Zinnias make great cut flowers. I got these at the farmers market last year. My garden friend gave me some dahlias. Looking forward to seeing what they look like when they bloom. Dahlias, with evidence of pests digging for roots (probably squirrels). Last season my aunt gave me full run of the flower garden at the front of the house. She had trouble with Scarlet lily beetles in 2014. She really hates bugs so once I told her what the beetles were and what they were attracted to, she wanted the lilies gone. However, she couldn’t bring herself to get rid of them right away. 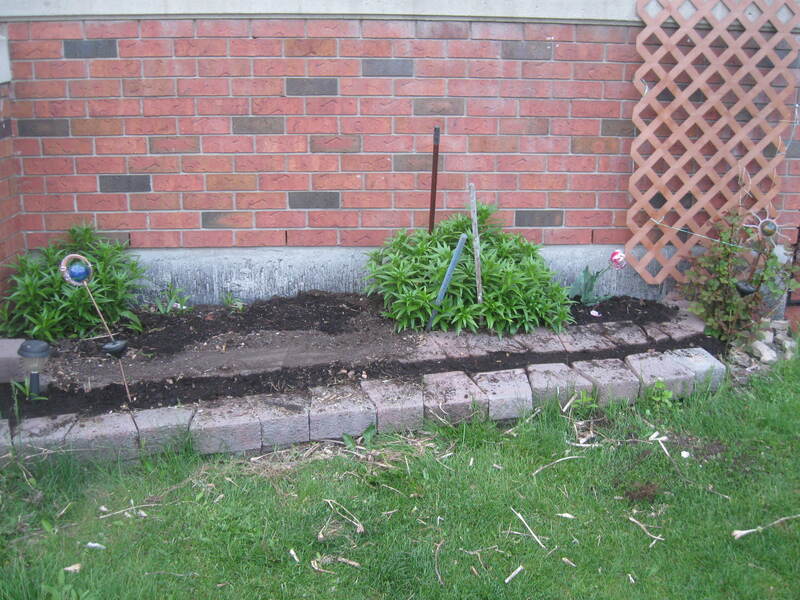 I was still left with plenty of space for my edible flower garden. I planted sunflower, cornflower, borage, lupine (not edible), and nasturtium seeds, and a lavender plant I bought at Kensington Market. I also remember planting viola but they didn’t take. 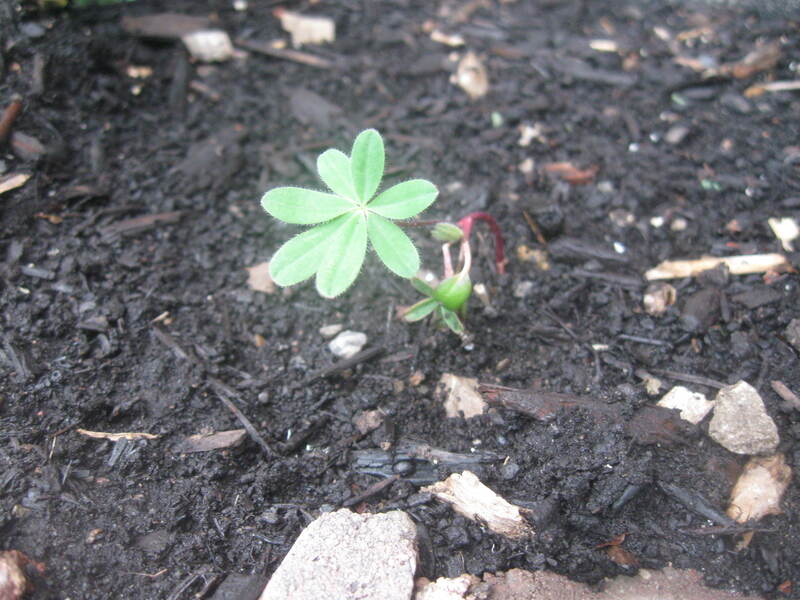 Lupine – planted out in late May. This is as big as the lupine got. It didn’t survive. 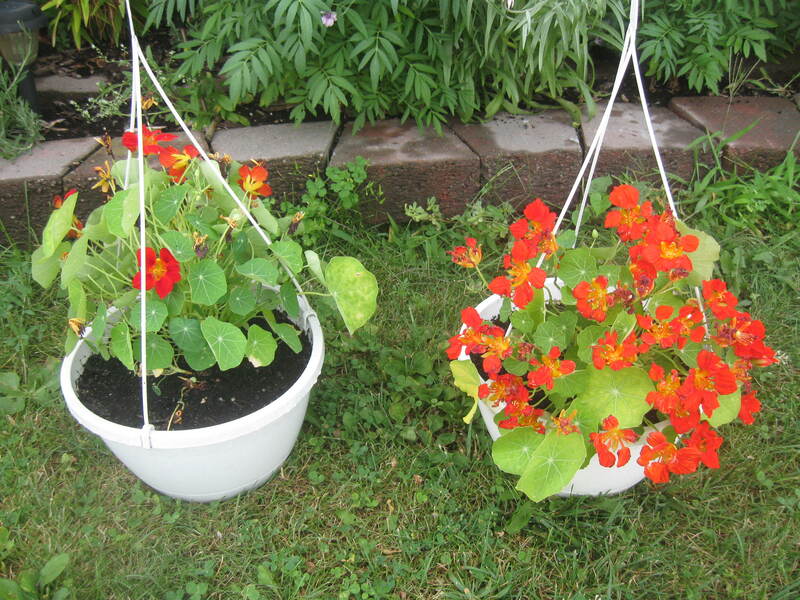 Although I didn’t have the trailing variety, I thought nasturtiums would look great in the hanging pots (at the front and in the back yard) and in the planter boxes on the railing. Unfortunately the pots at the front were attacked by aphids. The ones at the back were perfectly fine. 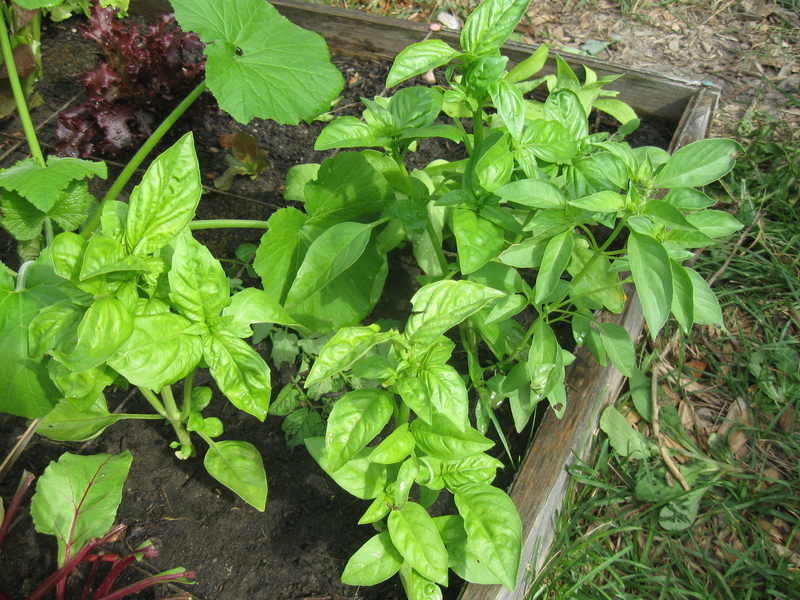 I purposely used seeds I had harvested from city plants at the front, knowing we wouldn’t be eating from those pots, and saved the organic seeds for the back yard. 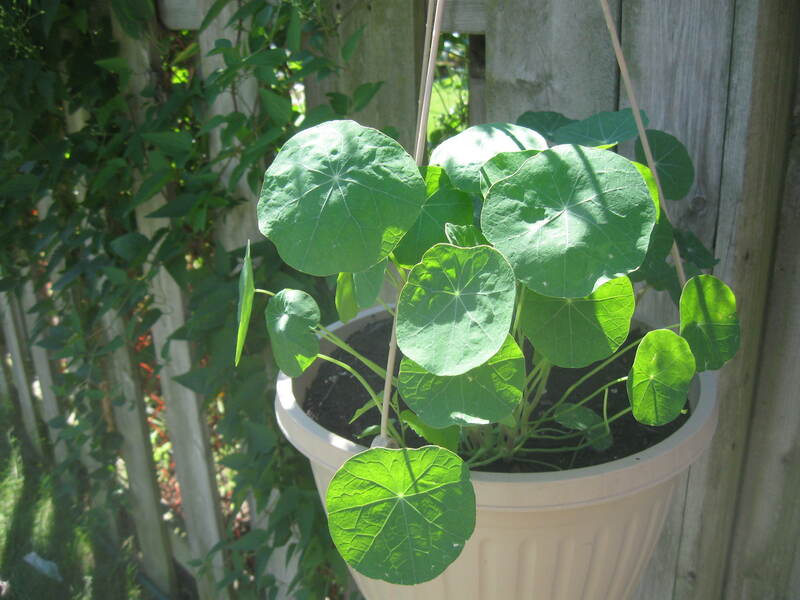 Nasturtium from organic seeds – looks tasty! Overall, I think the flower garden turned out pretty well. 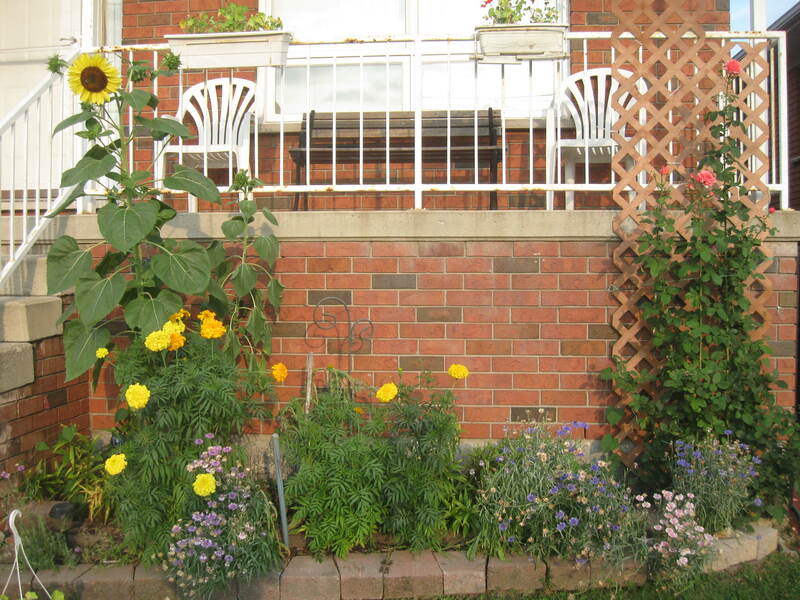 L to R – lavender, lilies, sunflower, marigold, cornflower, roses; nasturtium in the planter boxes. End of August. 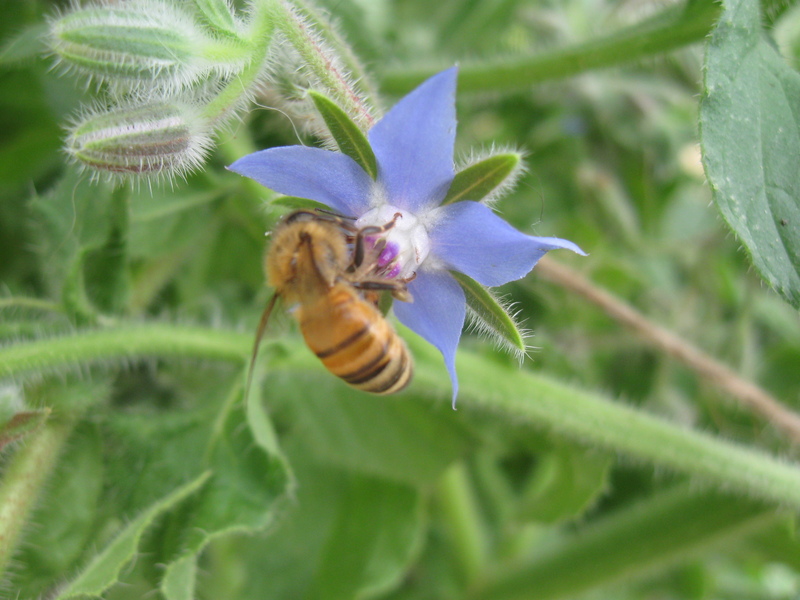 Borage had already run its course. I bought some other flower seeds that I didn’t end up using this year: cosmos, larkspur, and poppies. 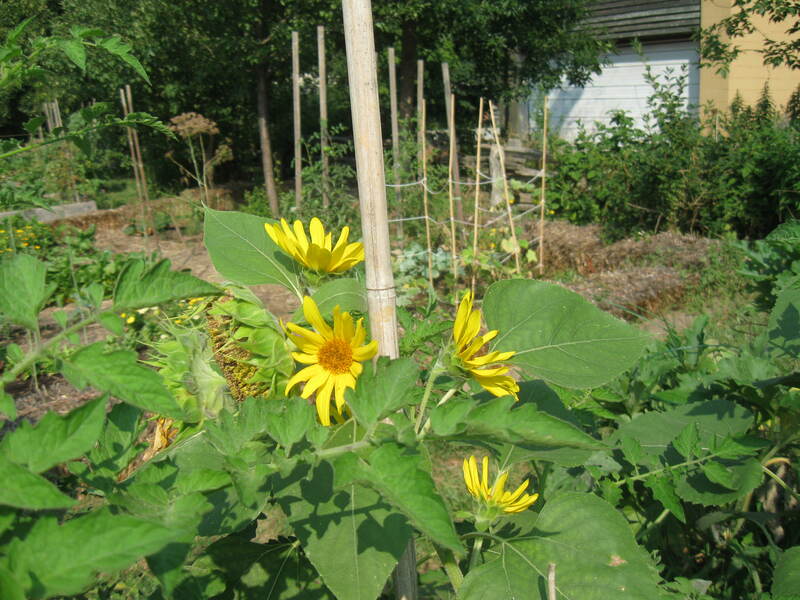 Hope to plant more varieties next year (and I’m eyeing some more I’d like to purchase – velvet queen and autumn beauty sunflowers, for example) and harvest some as cuttings in addition to using them as companion plants. One of the reasons I love gardening is that there’s always something going on. 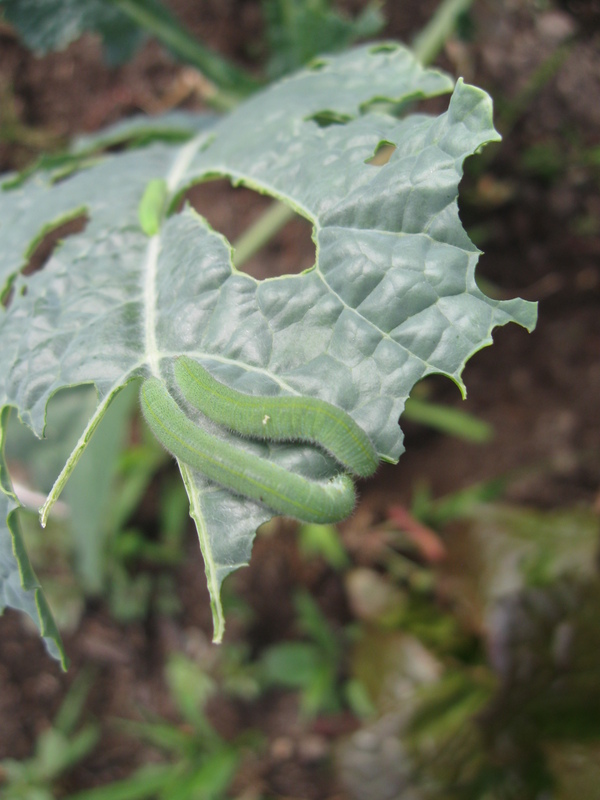 The garden is teeming with life and activity 24/7. Something new is always waiting to be discovered. Lately I’ve been spending a lot of time watching the bees. There have been a lot of posts on the Facebook pages I follow about pesticides killing off our bee population, including powerful photos of what the fresh fruit and veg isle of our grocery stores would look like if there were no more of these essential pollinators. I think about this as I watch them go about their daily lives in the garden. I find the bumblebees in my garden particularly funny. 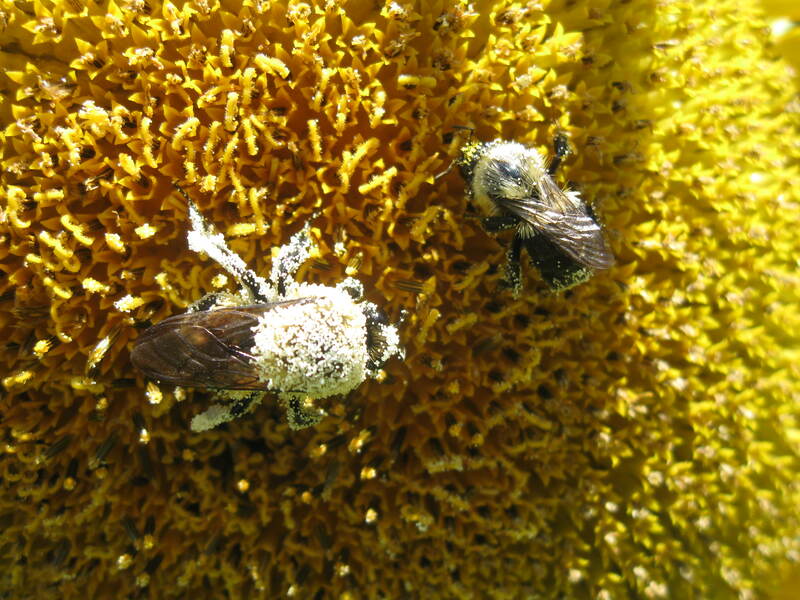 The way they bumble around… They almost look like they`re high, covered in pollen as if it`s cocaine, or drunk. 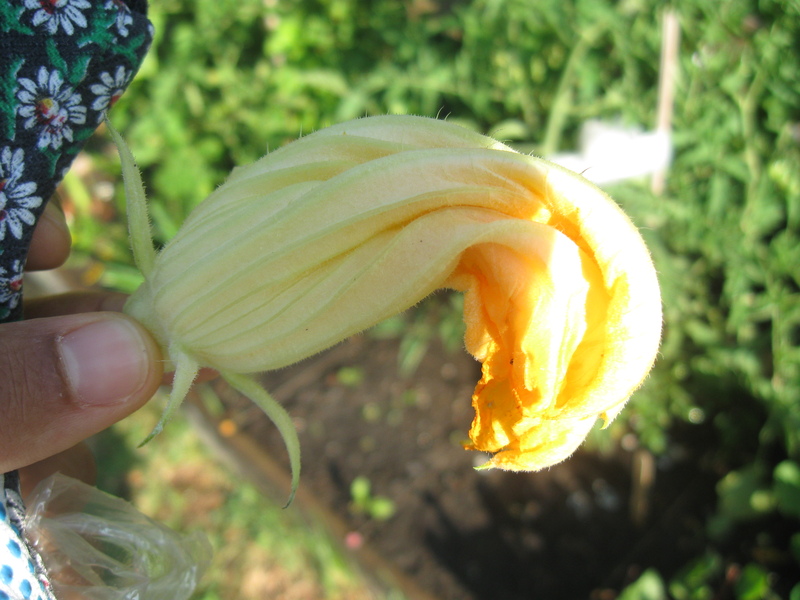 This guy staggered out of this zucchini flower like he was drunk! I joke, but in all seriousness they work really hard, doing the things that help to produce the abundance of fresh veggies that I enjoy on a daily basis. Then they return to their hives to continue the work that produces other delicious and useful things: honey (yum) and beeswax. This guy was staring at me as if I was interrupting something private. Nowadays, more and more people are thinking about and questioning how their food is produced and where it`s coming from. People are coming together and advocating for better and healthier food choices. Something so basic to our survival has become so complicated when really it shouldn`t be. And honestly, it isn`t. When we put growing food back into our own hands, we feel empowered and we make better choices. There are so many options for where to grow your own food – your own or a friend`s back yard, balcony or rooftop, a community garden, an allotment plot. If you don`t have your own space, you can share with others. 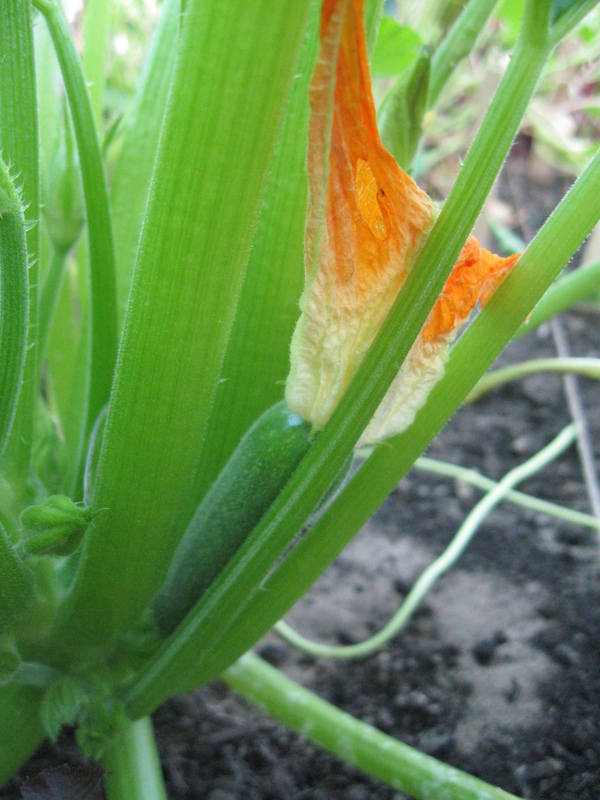 I just have to look at my gigantic zucchini plant to realize that one tiny seed produces so much with very little effort. It`s easy! We waste a lot of time and effort on things that don`t matter and neglect things that do or should matter to us. Growing your own food and supporting local growers is a great way to spend time with family and friends and to build community, which should be what life is all about. It’s rainy and cool out there and forecasting more rain for the weekend. Feeling an ominous air of summer coming to a close and I haven’t made it to any Farmer’s Markets yet. Or the beach. Feeling reminiscent and as a result I’m thinking back on the successes and failures of the garden this season. 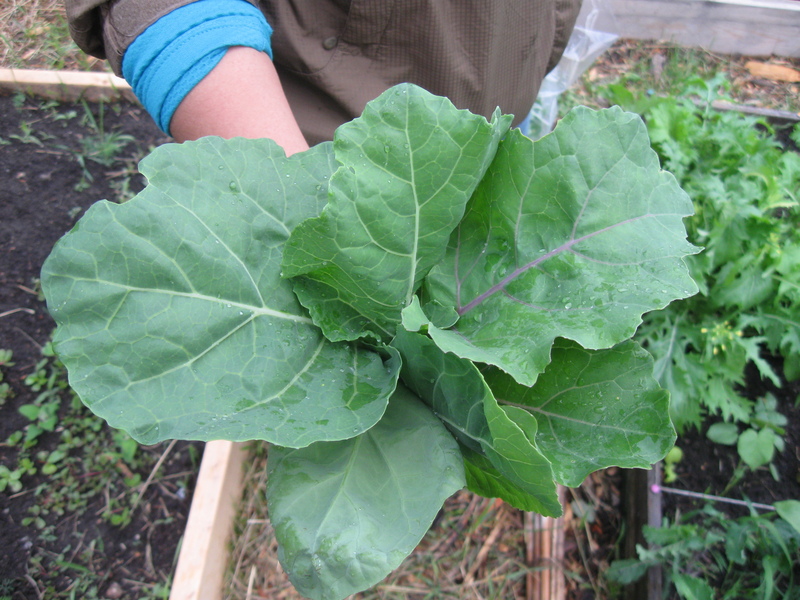 My favorite new addition this year was the collard greens. My sister really likes them so I bought seeds especially for her. What a beautiful and tasty green! The stuff at my local grocery store is ginormous and tough while the collards in the garden were tender and non-mutant. The kale was pretty good too but the collards seem to do better. 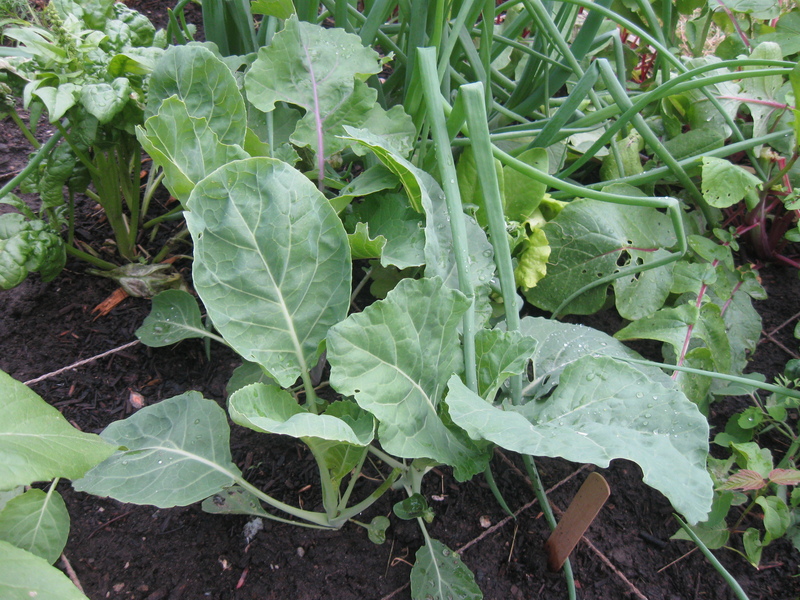 Kale is supposed to be better in the fall, and tastier after a light frost, while collard greens tolerate the heat better. We’ll see how they do in the fall planting. Even though I only got one measly piece of fruit from the plant and it took up a heck of a lot of space, I’m still glad I tried zucchini this year. I’m hoping there’s still time for the new plant to make more fruit before it starts to get too cold. 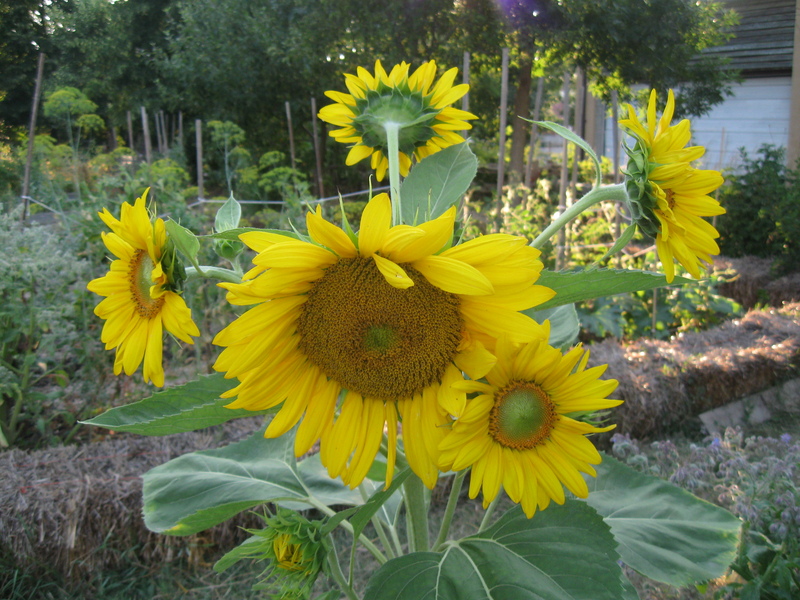 Luuved the surprise of the multi-headed sunflowers this year. 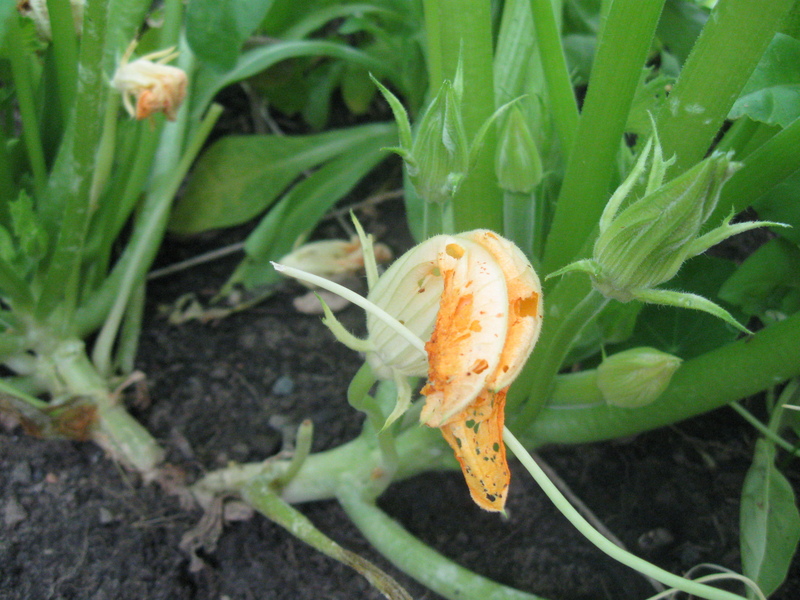 They are looking pretty atrocious in the garden right now as they are coming to the end of their life cycle. The cucumbers are pulling them down as well, but I can’t take them out until I can figure out another support for the cucumbers. 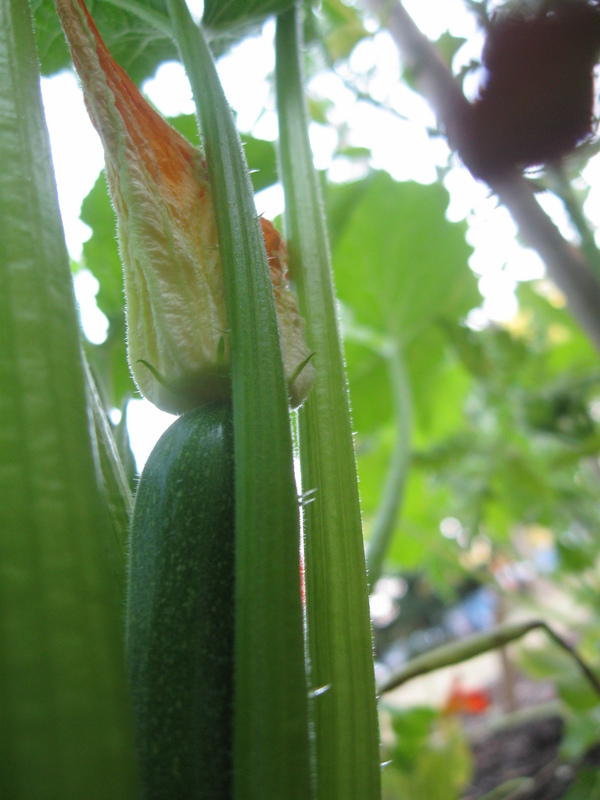 The cucumbers were probably the biggest surprise for me, in the sense that for the longest time my brother and I thought the plant wasn’t doing anything at all. Turns out all the fruit was hiding underneath its large leaves. 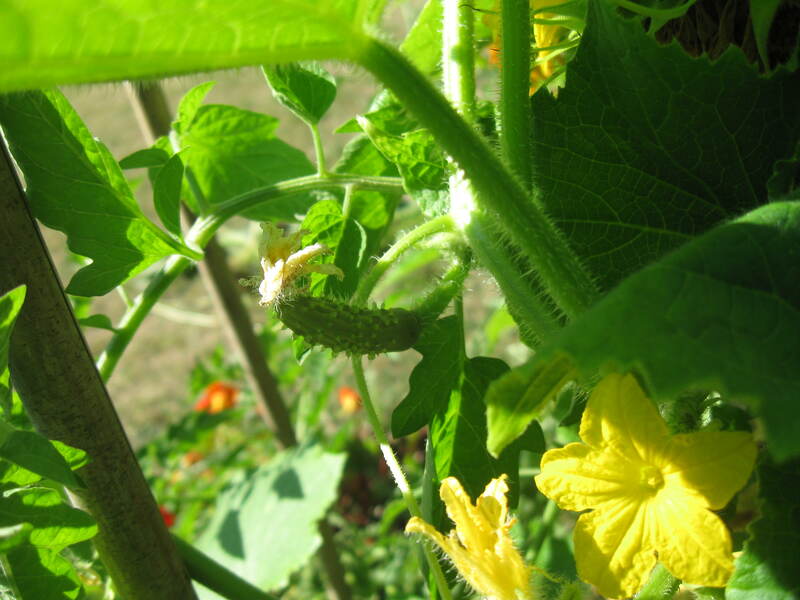 What a joy to come across even a tiny cucumber! 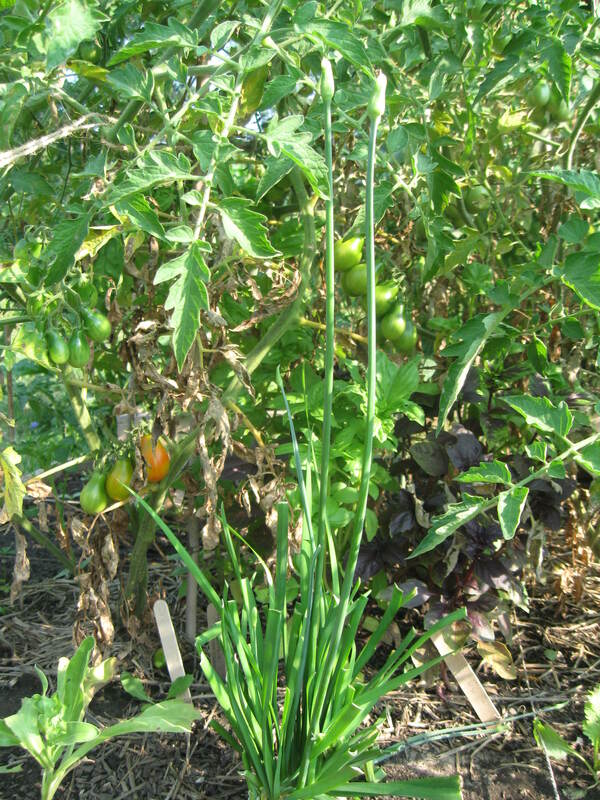 I was probably the only one in my family that enjoyed the chives this year. My sister complained that they were bitter and tough, but I quite liked the taste. I like to sprinkle it onto my meals for a nice onion-y kick. Did I mention these are garlic chives?! I’d forgotten. 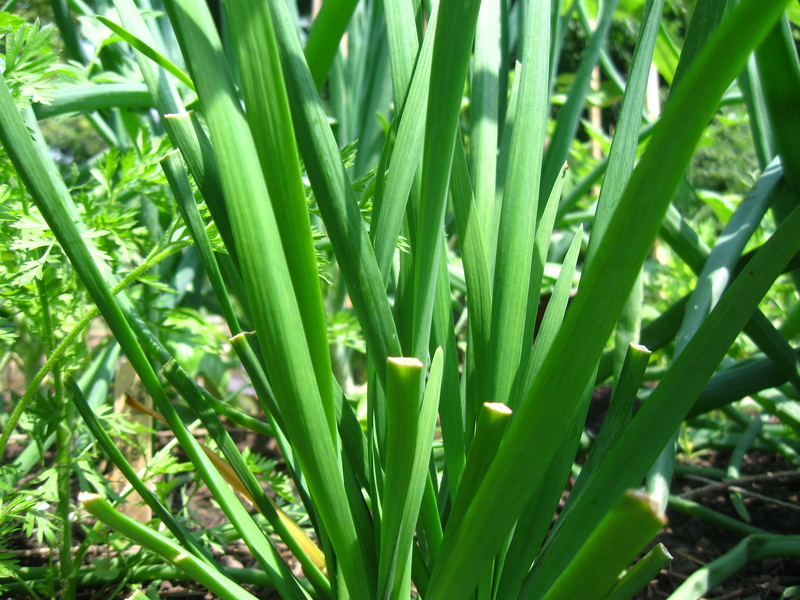 Apparently they are much tastier than regular chives. 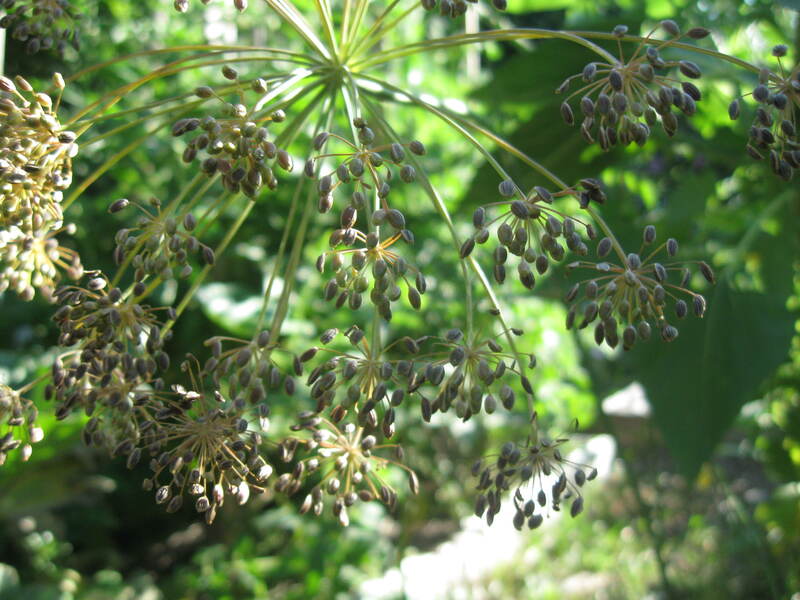 Garlic chives sending up flowers – blossoms are apparently very tasty! 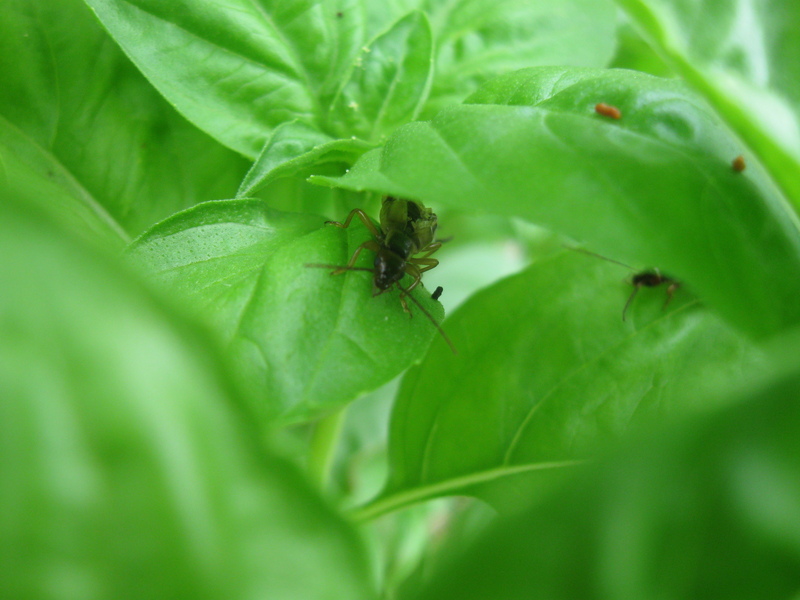 I came to really appreciate basil this year, not only for its tastiness but also for its hardiness. It did really well in the garden, probably better than anything else. And it’s still doing well! This exercise has totally cheered me up. Looking forward to some sun! Last year I started saving seeds for the first time. 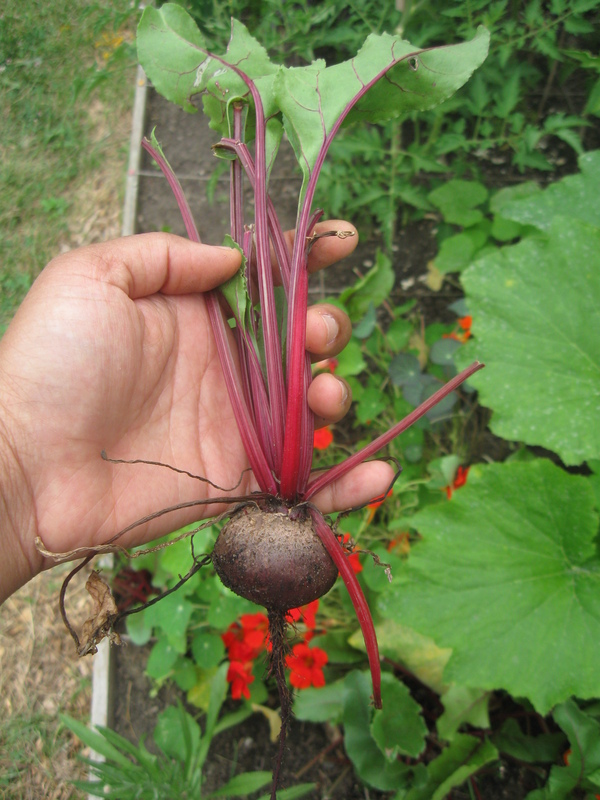 I got the general idea of seed saving from You Grow Girl or Grow Great Grub by Gayla Trail. 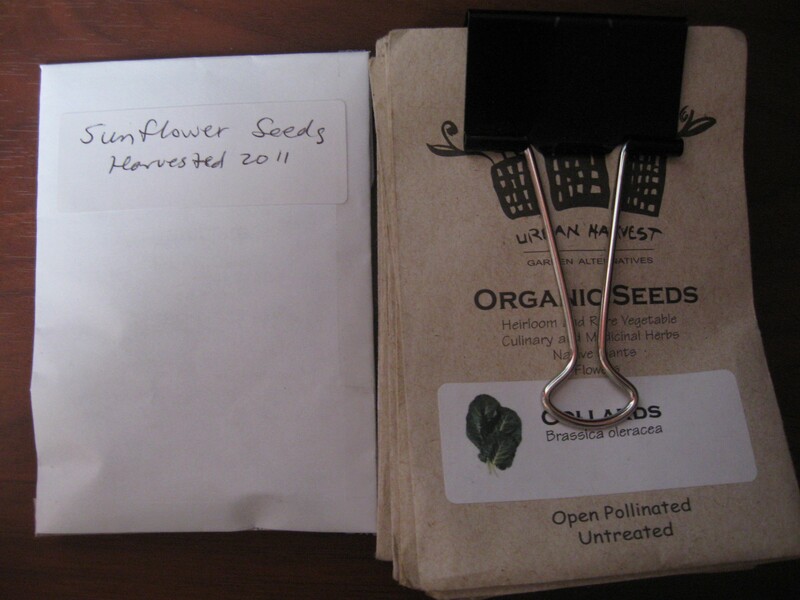 I decided on sunflower seeds for a reason that now escapes me… I read about how to do it online and watched some videos on Youtube. You can either cut off the sunflower head and dry it or dry it on the stem. 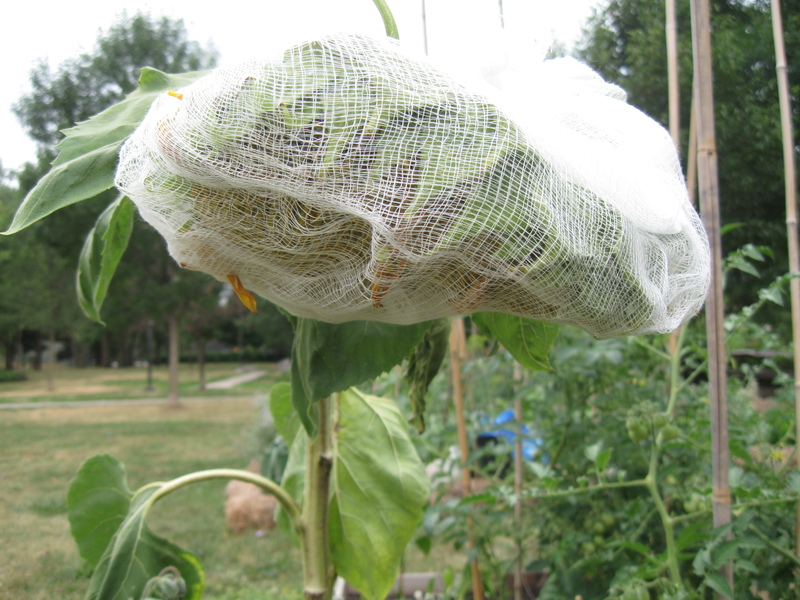 The cheese cloth is to keep birds or other critters from getting at it. 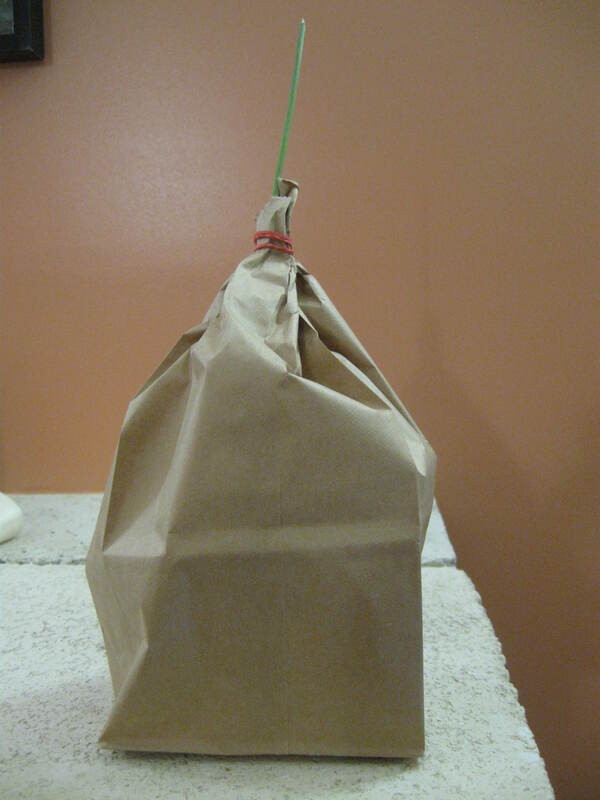 I’ve also read you can use a paper bag but this must be for smaller flower heads. I picked out the seeds from the head and dried them indoors on a hard surface. 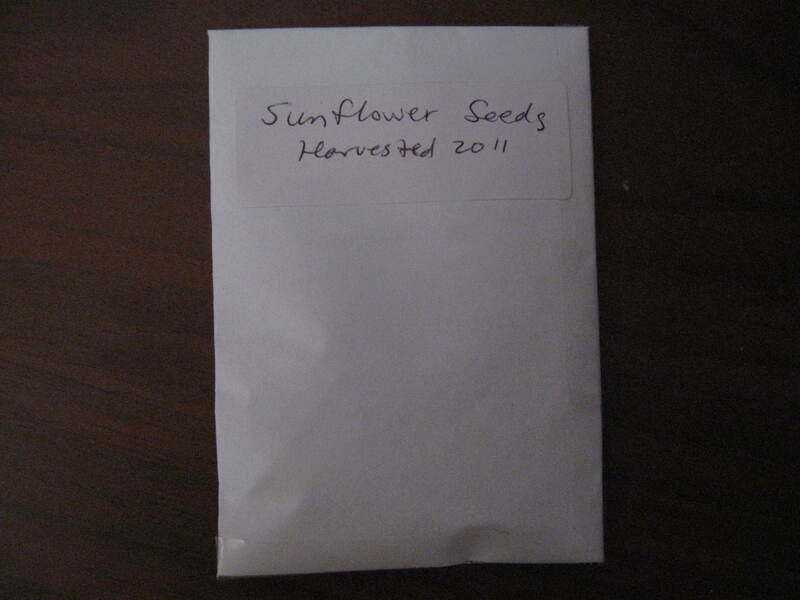 I kept them in a plastic bag all year, which is not good, but it surely didn’t affect sunflower production this year. In fact, the only difference this year is that the sunflowers were poly-headed (my scientific term), specifically with one large head and several small ones, whereas last year they were mono-headed. I still have so many sunflower seeds left that I don’t need to do it this year. This year, I want to be more active with seed collection because it’s easy and it’s cost effective (no need to buy seeds next year). I decided to start with dill because the seeds caught my eye. To be sure I was doing it right, I searched the net and came across the Deep Roots at Home blog. What caught my eye was the suggestion to add holes to the bag for circulation! So I poked some holes in it with a safety pin. Hope that’s good enough. 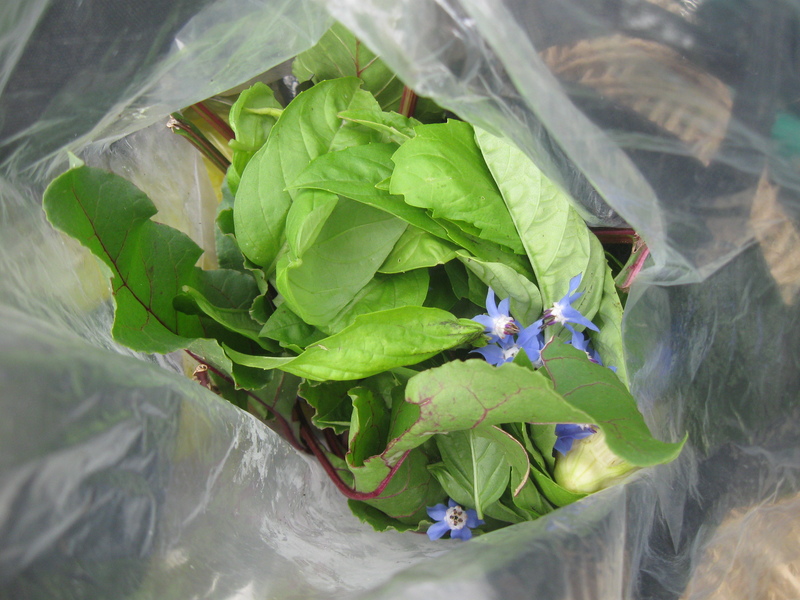 The blogpost also shows that you can have several stems in one bag. Right now I have 3 bags going with one stem each because I wanted to be sure they got enough air to dry properly. Totally unnecessary. I know for sure that You Grow Girl had a template for seed packets. 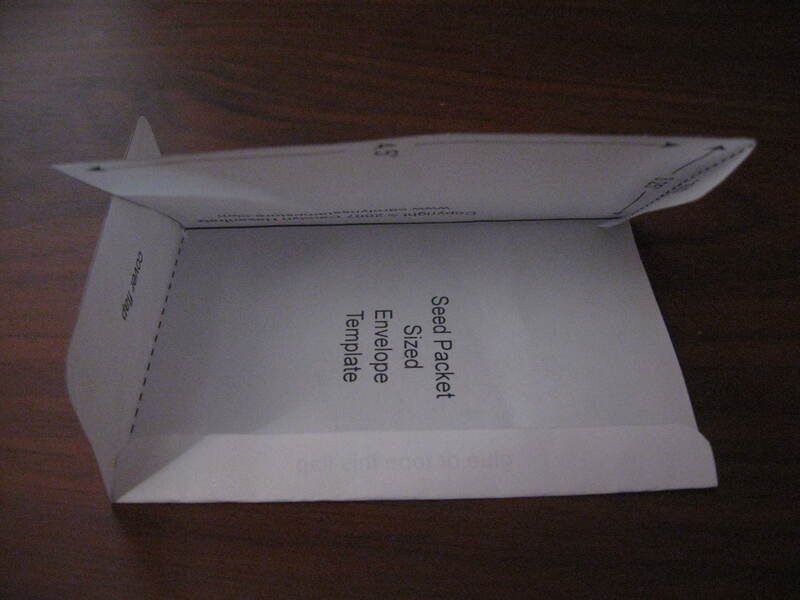 There are many seed packet templates online. I chose one at Carolyn’s Stamp Store because I liked the simple design and clear instructions for putting it together. I didn’t have a glue stick so I taped it together, put my sunflower seeds in and made a simple label. You Grow Girl suggested fancy designs but I decided to make it simple. I don’t consider myself to be crafty, but I do have crafty aspirations! I came across this Vegetable Seed Saving Handbook online. I love that it tells you how long you can save your seeds. 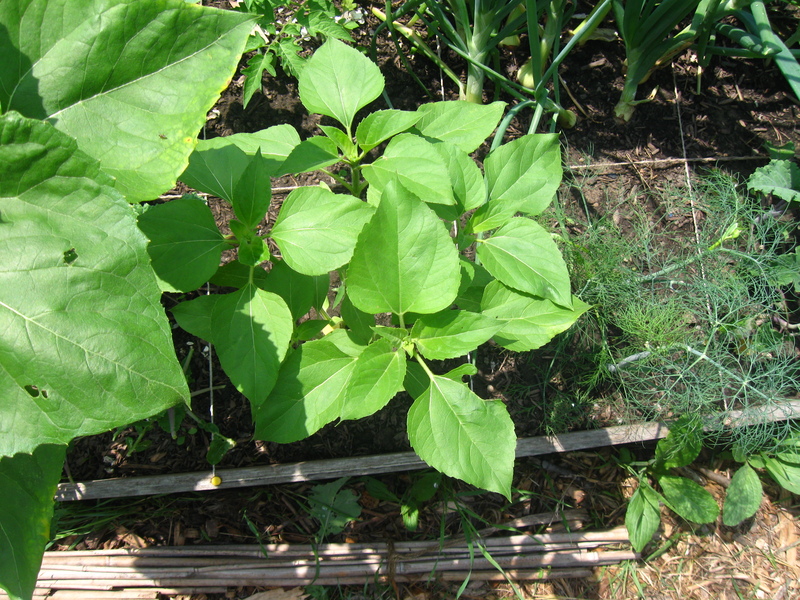 For example, it says dill seeds will last 3 years or more and sunflower seeds (between squash and Swiss chard on the list; there is no direct link) will last 5 years or more if stored properly. Can’t wait to package my dill! It’s been really humid this summer. I’m noticing that plants such as the borage and tomatoes that were so chipper and upstanding last year are looking limp and sad. It thunderstormed yesterday afternoon, bringing much needed rain. As a fellow gardener said to his friend: “If I don’t water, it won’t rain.” I watered in the morning as well and as I watched the downpour I worried that my plants might have gotten too much water. But I’m looking forward to seeing the results of the rain. You can water as much as you want, but it’s only after the rains that plants really flourish. It must be the nutrients in the rain. I don’t have much nutrient-rich kelp meal left, so I’ve been saving it for when I plant the fall crops. 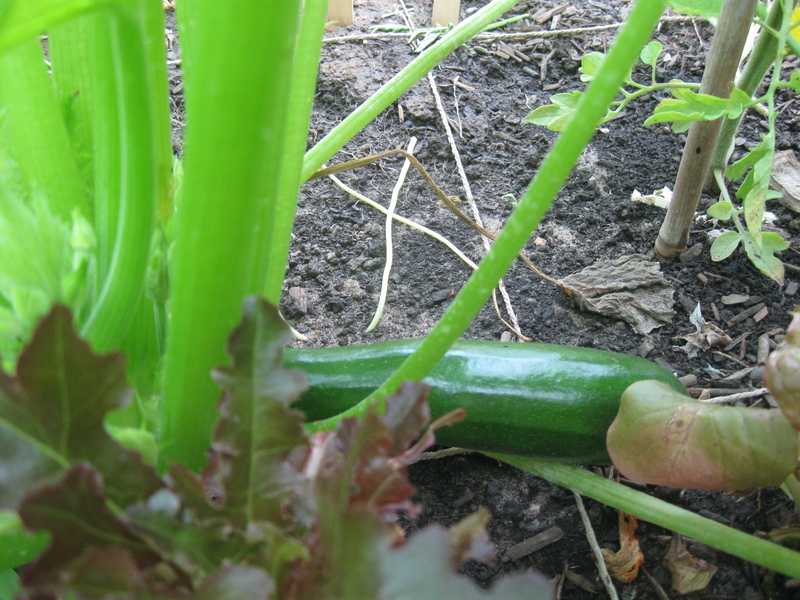 While at the garden, I picked the first zucchini of the season. It was small, about 7 inches long, but firm with very few blemishes. My family enjoyed it raw in a bean salad. Very nice. First zucchini of the season! 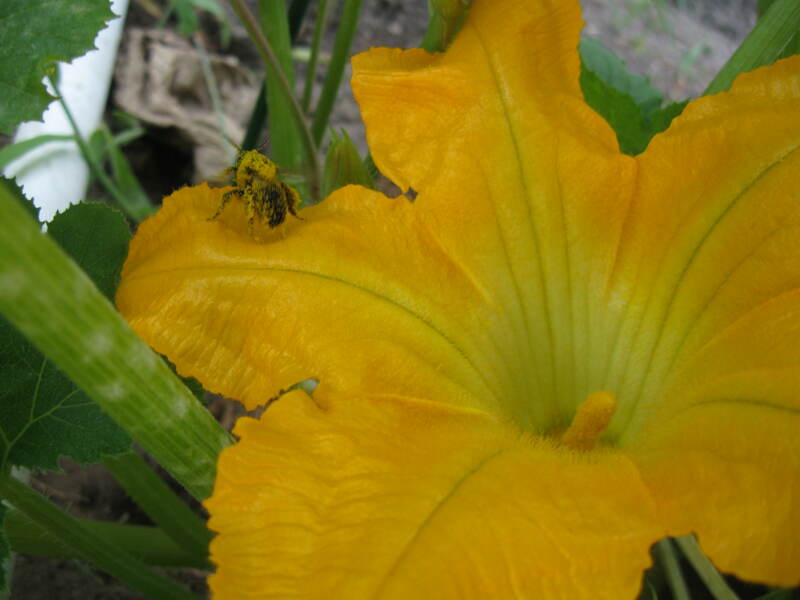 There are a lot of male flowers on my zucchini plants (the female flowers are at the end of the zucchini). 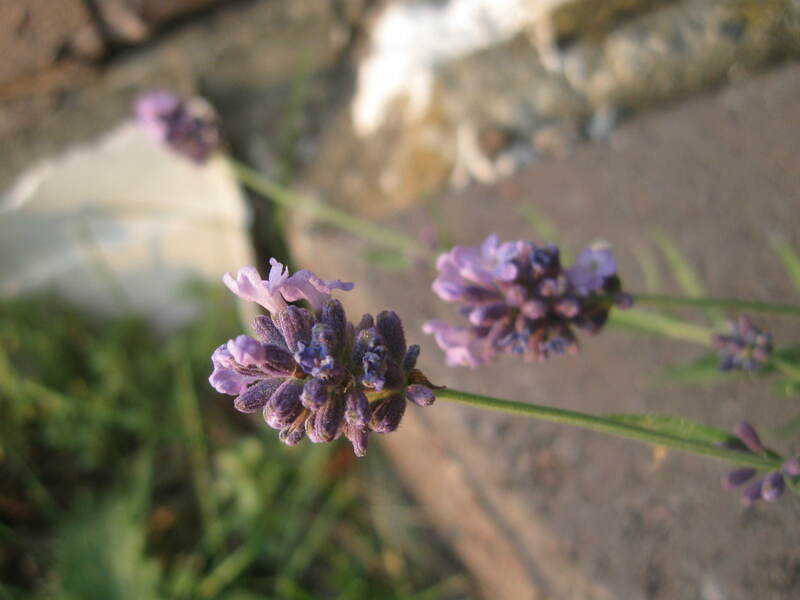 I picked two, one of which was housing about 6 earwigs (I shook the flower and they fell out). I’ve been reading online that you can batter, stuff, and fry them up and that they taste divine. I might just try it or a less labour-intensive baked version. Gardening is definitely giving me an appreciation and a comfort level around bugs. I used to be really creeped out by earwigs, in particular, when I was younger. I can say this year they don’t bother me so much. 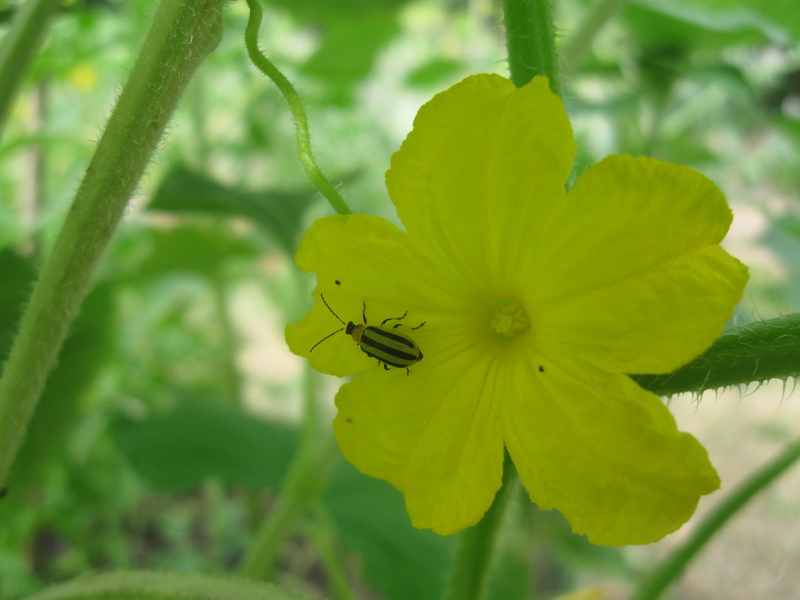 I managed to photograph the very beautiful cucumber beetle exploring a cucumber flower. I’ve had a hard time killing these little buggers, they fly away so quickly. I’ve been a bit obsessed with trying to photograph as well as kill them. I’m glad none of them have managed to damage my zucchini. I’ve read online that you can plant radishes near cucumbers to repel the beetle so I planted some Hon Vit radish from my Spicy Salad Mix package. You can also lay down onion skins. I don’t know how effective these interventions are so we’ll see what happens. 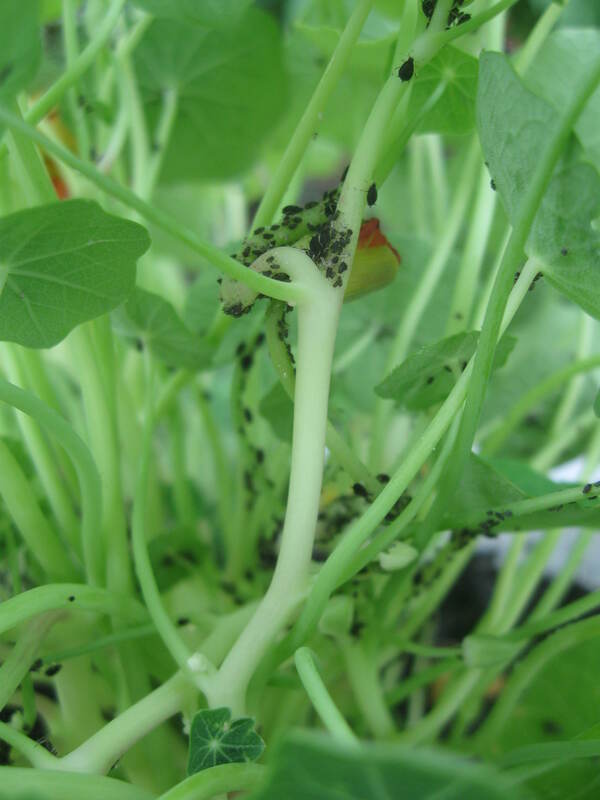 Apparently the Marketmore cucumber I planted are disease resistant. I guess that’s not the same as pest resistant. 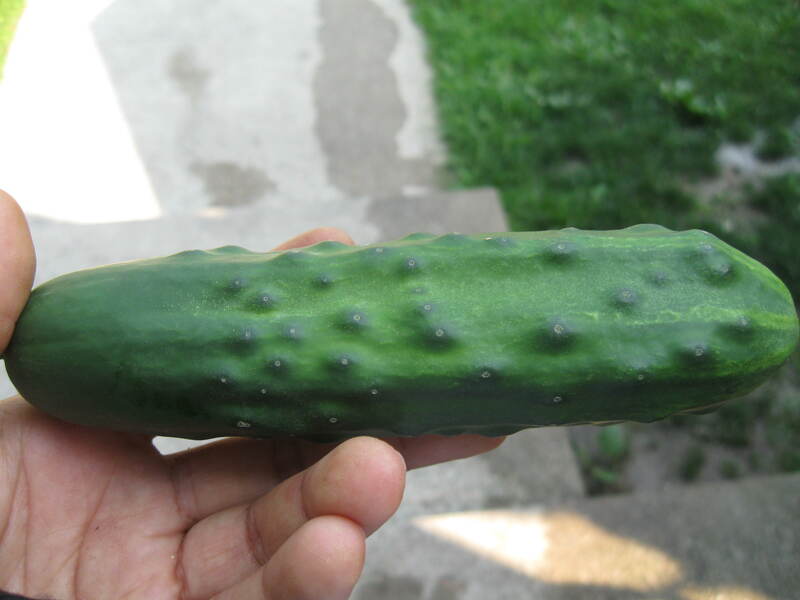 Incidentally I’ve been wondering when I will start seeing cucumbers. Turns out they can take anywhere from 55 to 70 days, which I had forgotten. This is length of time is disappointing, but reassuring that my lack of fruit at this stage is perfectly normal. I think I planted around the beginning of June so I should see fruit around the beginning of September. I’ve been quite lax with picking off the suckers of my tomato plants. Some of them have already turned into long branches with flowers so I picked off the ones without flowers. 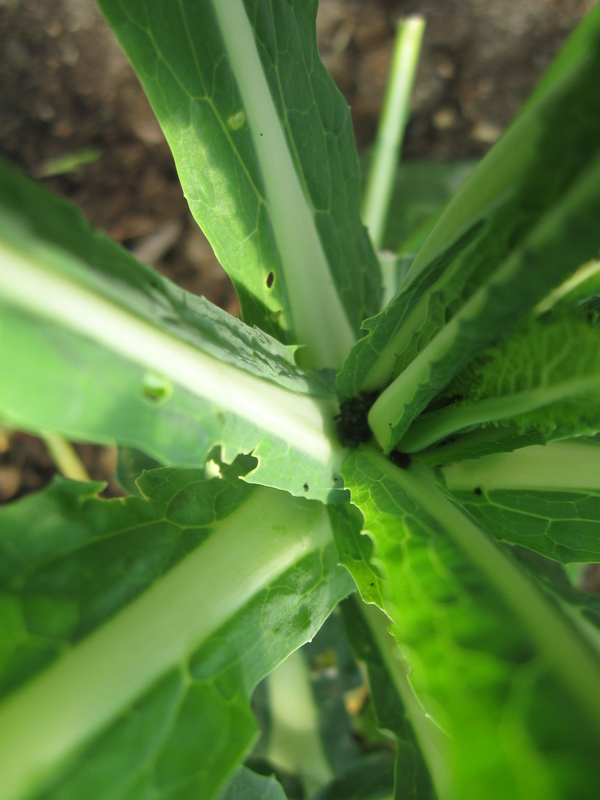 I’ve noticed on one plant that the bottoms leaves are spreading out across the ground. I remember reading somewhere that you should remove the leaves close to the ground but I can’t remember why. Many of the forums I’ve looked at today say that removing the bottom leaves increases fruit yields, that they should be removed if they are yellow, and that because they are close to the ground they could pick up diseases. 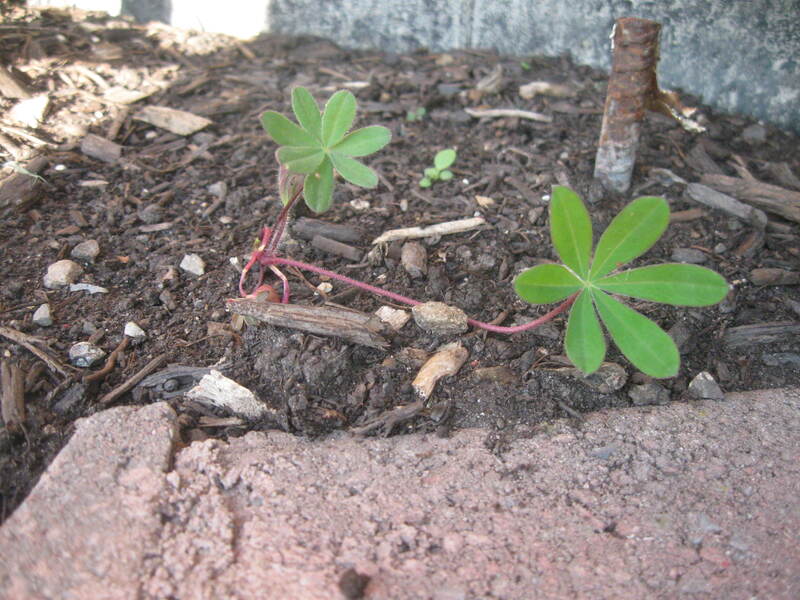 The leaves near the ground on my plants are green and show no sign of disease. 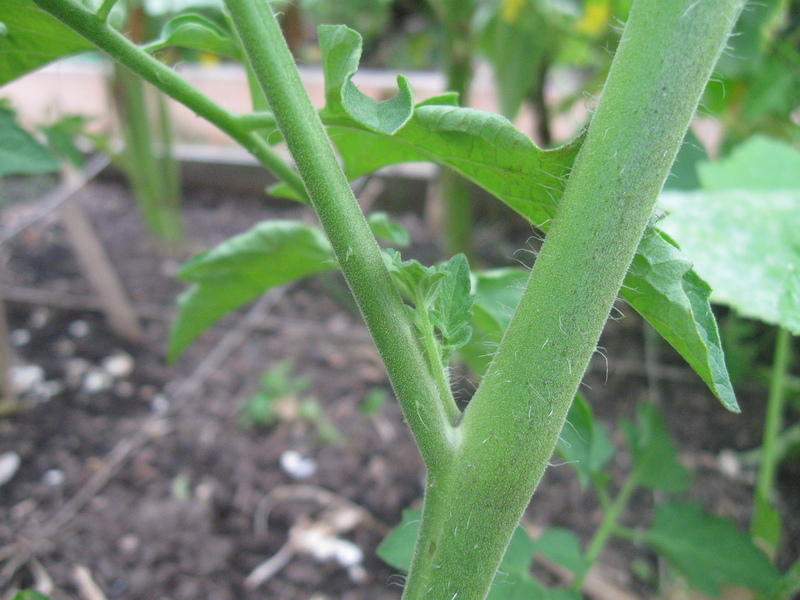 Some forum posts gave logical arguments against removing leaves, stating that leaves are required for photosynthesis and that we don’t go around pulling leaves off of other healthy plants so why do it to tomatoes. I think I’ll just watch and see what happens. It does seem like I have less tomatoes than I did last year, but maybe it’s still early. I planted some dill and parsley. 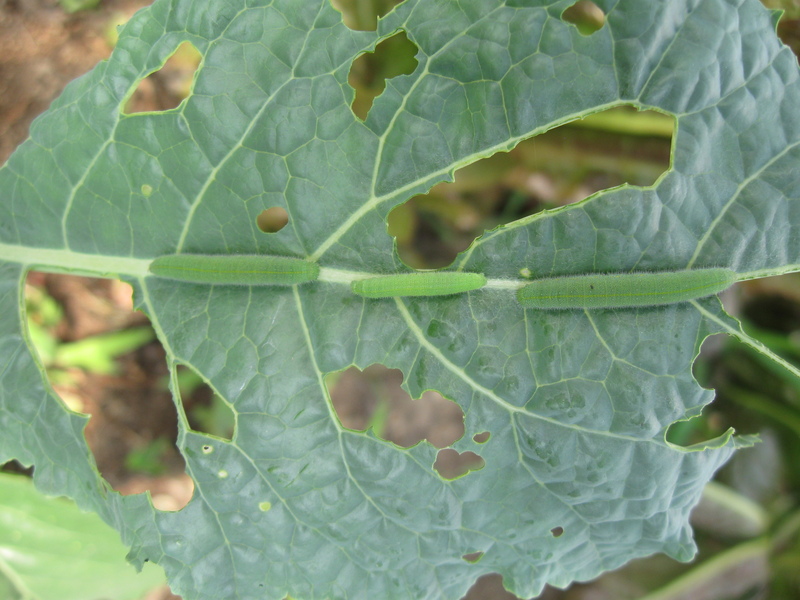 I was happy to see that the collard greens I had planted either last week or the week before are starting to come up but upset to see that leafminers have already begun attacking them! I had to tie up my borage plant with twine. 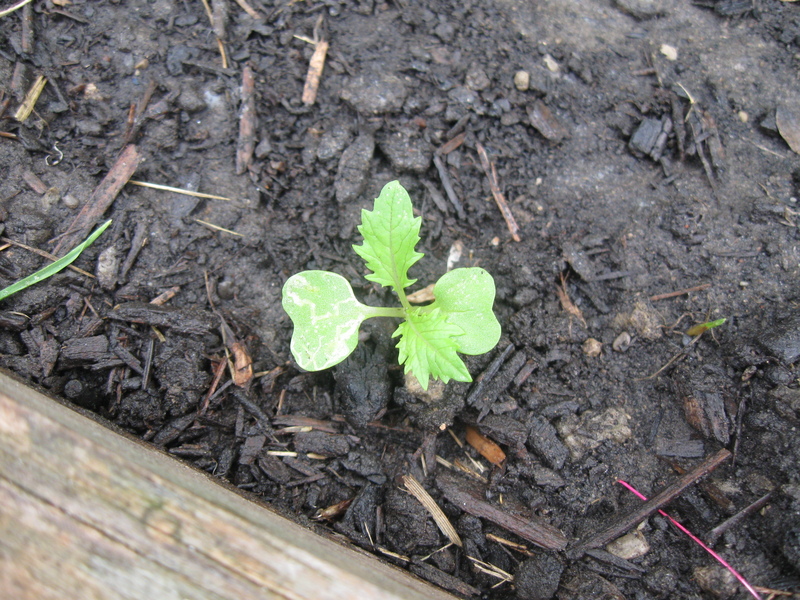 It was falling onto one of the tomato plants and keeping the parsley that is already growing from getting any sun. One branch was actually breaking off but I thought if I tied it up it might heal itself. 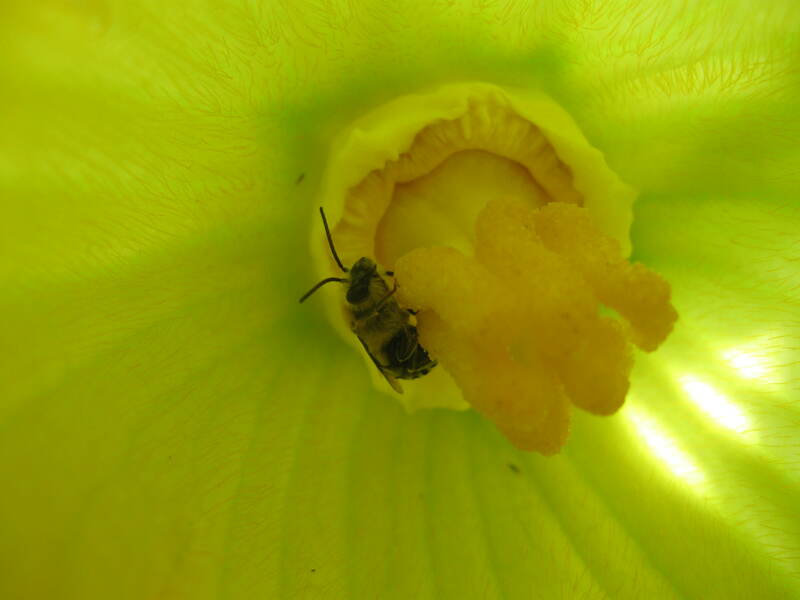 Many of the flowers are not open yet, but the few that are open are being visited frequently by pollinators. Good stuff. 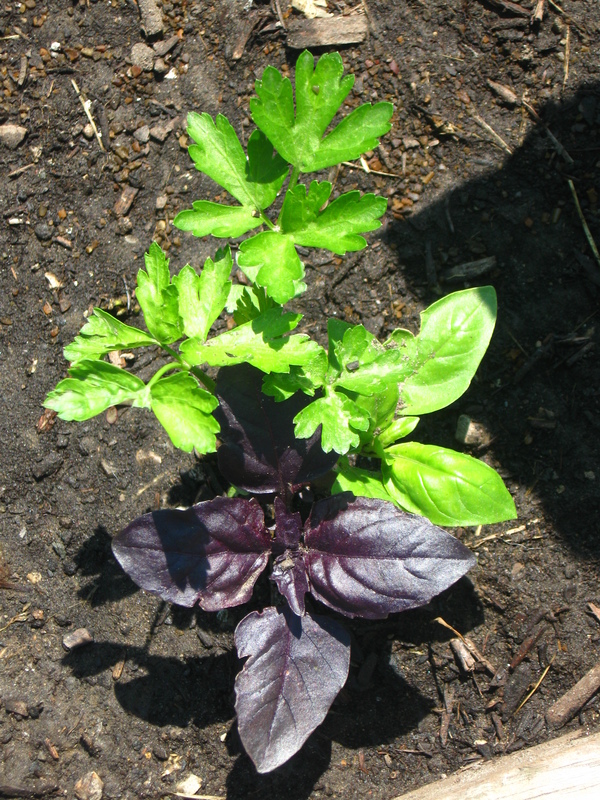 I harvested mostly basil today, with some nasturium leaves, borage flowers, a beet, and the zucchini. 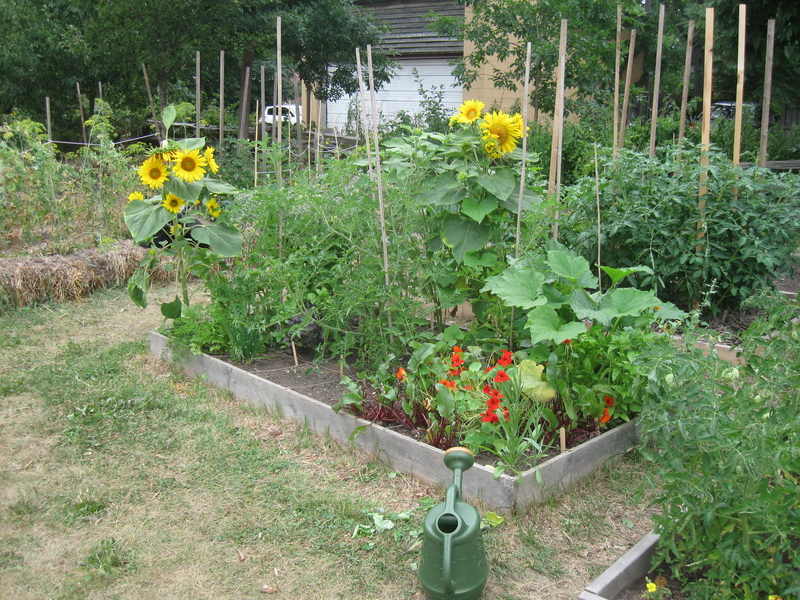 My brother told me the blogger for our community gardens wants to feature our plot in an upcoming blog post. Exciting! We’ll see if it comes to pass. I think what stands out in my plot are the flowers. 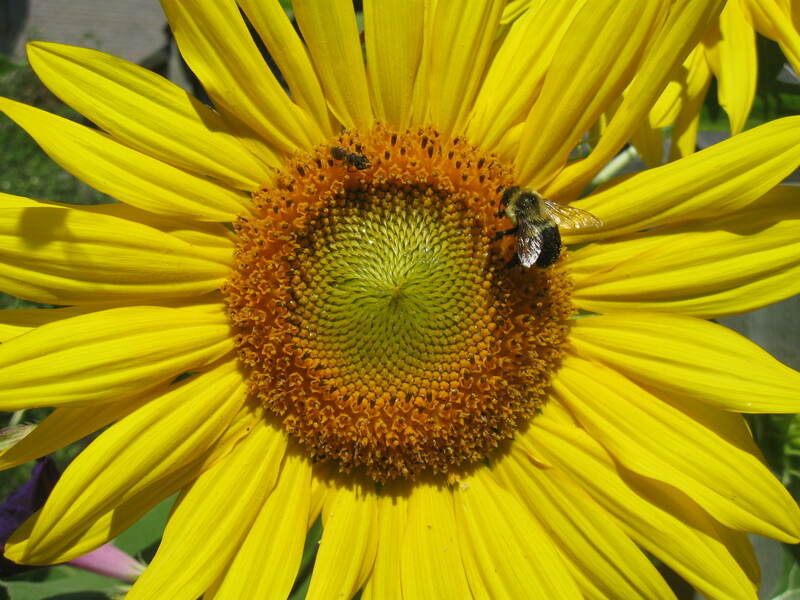 One might think they are a waste of good growing space (especially my 3 squares of sunflowers), but they are essential for attracting pollinators. And they look so pretty!